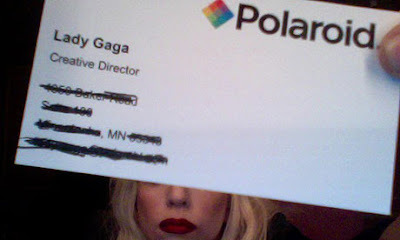 "I am so proud to announce my new partnership with Polaroid as the creative director and inventor of specialty projects," said Lady Gaga. "The Haus of Gaga has been developing prototypes in the vein of fashion/technology/photography innovation, blending the iconic history of Polaroid and instant film with the digital era. Lifestyle, music, art, fashion: I am so excited to extend myself behind the scenes as a designer, and to as my father puts it – finally, have a real job." I've gotten around the discontinuation of instant Polaroids by confiding in my Fuji Instax Mini for my instant photo needs, but I'll definitely be checking out Polaroid's digital line once Lady Gaga's products hit stores in late 2010. These were also used as inspiration for my Gaga costume this past Halloween, which I don't mind posting again due to the fact I was in the HOSPITAL all Halloween night! love Lady Gaga so much! !